EXECUT REPARATII CALCULATOARE (LAPTOPURI, NETBOOK-URI), TV COLOR (CU TUB, LCD, PLASMA), STATII AUDIO, ETC. 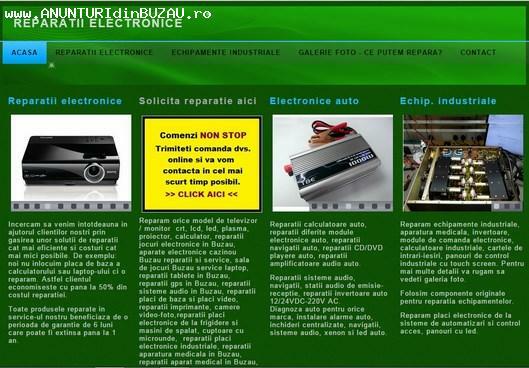 SOCIETATEA COMERCIALA S.C TNT OPTIM ELECTRIC S.R.L BUZAU COMERCIALIZEAZA SI ASIGARA GARANTII SI POSTGARANTII LA TOATA GAMA DE PRODUSE COMERCIALIZATE.SERVICE SPECIALIZAT IN REPARATII ELECTRONICE : TV CRT, TV LCD, TV LED, AUDIO, VIDEO SI ELECTROCASNICE. ADRESA: BUZAU, BUZAU, BD. STADIONULUI NR. 66.